Charles the Bold surprising David Aubert. 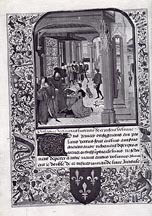 Commentary: The son of Jean Aubert I, ducal functionary, David Aubert is one of the most famous calligraphers, translators, and compilers in the service of the Duke of Burgundy between 1458 and 1479. 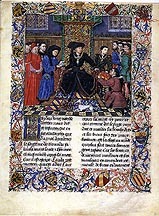 Attached to the Dukes Philip the Good and Charles the Bold and the Duchess Marguerite of York, he completed manuscripts for Antoine de Bourgogne and Philippe de Croy. Illuminating the Renaissance , p. 231: Despite claims by previous scholars that David Aubert authored these volumes, he seems to have responsible only for the transcription of the work. 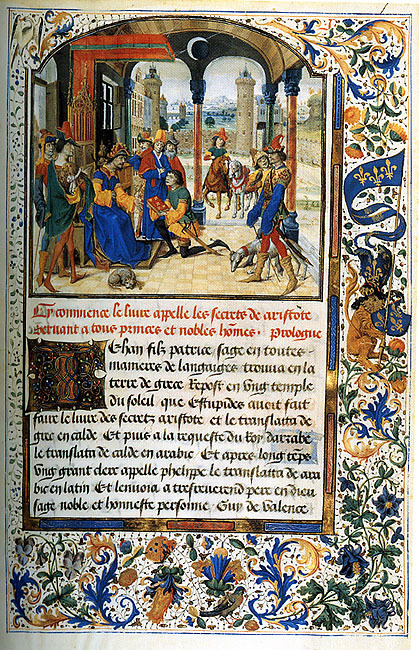 According to the text itself, the Histoire de Charles Martel was converted into prose in 1448, based lost verse romances. A compiler's name is not given, but in its content, the text is very much in line with those compiled by Jean Wauquelin around that time. 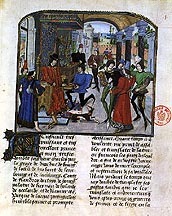 His Girart de Roussillon in particular concerns some of the same characters as the Histoire de Charles Martel and is an identifiable source for the Histoire. Together, all these texts reflect the ambition of Philip the Good to position himself within an illustrious tradition dating back, at the very least to the time of the Carolingian Empire. 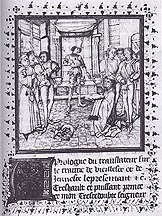 The completion by Charles the Bold of the Histoire de Charles Martel for the ducal library was not only part of a pious consummation of a project undertaken by his father; it was also consonant with Charles the Bold's own egocentric ambitions and aspirations as a modern-day Charlemagne and true heir of Charlemagne's empire. 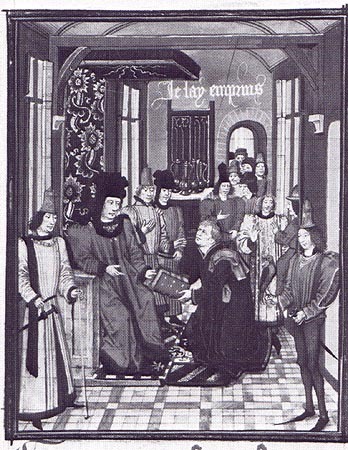 Whereas the text was copied by Aubert withing the ducal household at Brussels --the first volumne in 1463 and the last in 1465-- the decoration was undertaken by artists based in Bruges. 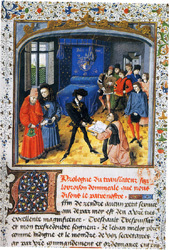 In 1468 the illuminator Pol Fruit was paid for the decorated intitials in the third volume, and in 1472 the miniaturist Loyset Liédet was paid for the forty-three miniatures in the third and fourth volumes, as well as further initials and the bindings, his signature is also incorporated into one of the miniatures at the beginning of the final volume (ms. 7, fol 9). The echo of Eyckian artistic ambitions found in this rare signature is complemented by Eyckian parallels in the composition of the opening miniature of the first volume, in which the writer is depicted being visited in his study. Bibliography: Charles le Témeraire, pp. 82-83; Illuminating the Renaissance, pp. 231-233, no. 55. 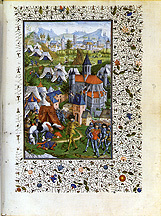 Date: 1463-65 for the copying and before 1472 for the miniatures. 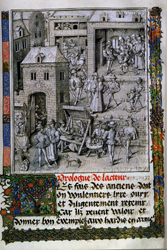 Commentary: The miniatures in the 4 volumes of the Histoire de Charles Martel were executed in the workshop of Loyset Liedet for Charles the Bold. They were paid for in 1472. 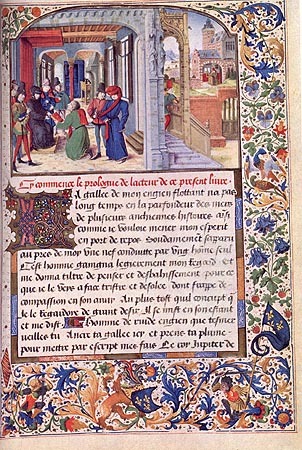 On folio 7 of ms. 9 there appears painted on the wall the signature "Loyset L."
Bibliography: Charles le Témeraire, pp. 82-83; Pascale Charron and Marc Gil, "Les Enlumineurs des manuscrits de David Aubert." In Les Manuscrits de David Aubert, edited by Danielle Quéruel,: 81-100. Cultures et civilisations médiévales 18, Paris, 1999. Bibliography: Illuminating the Renaissance, no. 55, pp. 231-233. 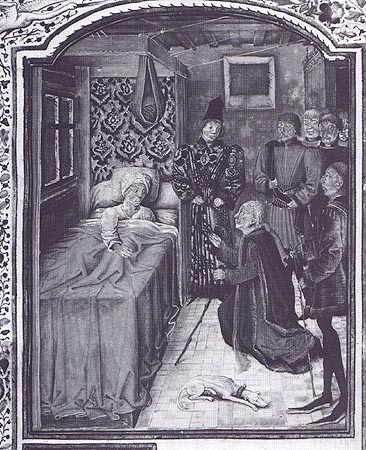 Bibliography: History of Private Life: Revelations of the Medieval World, p. 379. Artists: Loyset Liedet (attributed). 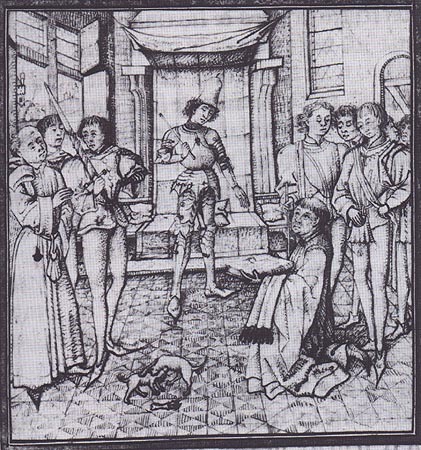 Liedet dies in 1478. Date: The manuscript entered the Burgundian Collection as "non historié ne enluminé" as recorded in the inventory of 1469. The inventory of 1487 describes the manuscripts as illuminated. Documentation: Lille, Archives départmentales du Nord. Fonds de la Chambre des Comptes, B 2068, Recette générales des finances, f. 331v: A Loyset Lyedet enlumineur et historieur pour xxii histoires quil a faictes au livre namme la Tierce partie des nobles princes de Haynnau de pluseurs couleurs au pris de dix-huit solz pour chascune histoire font xix.l., xvi. s. Item pour les avoir fait couvrir relyer et dorer par dessus les listes iii.l.xvi s. Item pour avoir fait clouer et y mettre dix gros cloux a boche avec les petis cloux et pour deux couroyes four les fremer xiv s.
Commentary: Attached first to Jean de Bourgogne, governor of Picardy, then residing about 1440 at Mons, Jean Wauquelin (author, editor, and copyist of texts), like David Aubert and Jean Miélot, executed major manuscripts for Philip the Good. 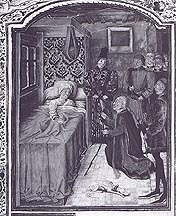 Jean died at Mons in 1452. 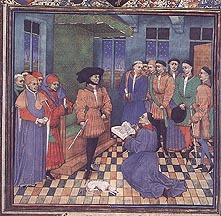 At the instigation of one of his counselors, Simon Nockart, Philip the Good commanded Wauquelin to make a French translation of the Annales Hannoniae by Jacques de Guise. Work on the first volume was paid for in 1448 and the complete work was finished in 1453. 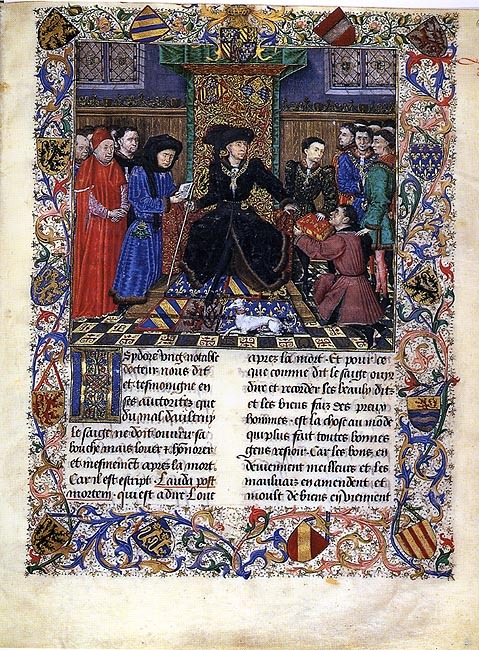 The first two volumes were illuminated under the supervision of Wauquelin while the last two volumes were not illuminated until the reign of Charles the Fearless. The second volume (ms. 9243) was completed in 1468 at Bruges in the atelier of Guillaume Vrelant and the last was completed by Loyset Liedet. Bibliography: Charles le Téméraire, pp. 80-81; Cockshaw, Les Chroniques de Hainaut, pp. 184-187. Bibliography: La Miniature Flamande, p. 139, no. 167. Dogaer, pp. 68-69. Paris, Bibliothèque nationale, fr. 1 216, f. 76: Hugues de Lannoy, Les Enseignements paternels. 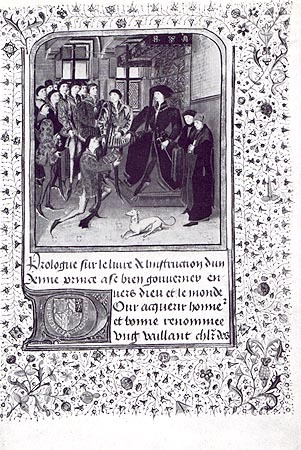 Bibliography: Bernhard Sterchi, "Hugues de Lannoy , auteur de l’Enseignement de vraie noblesse, de l’Instruction d’un jeune prince et des Enseignements paternels,"
Jean Wauquelin (or Simon Nockart) presenting copy to Philip the Good. 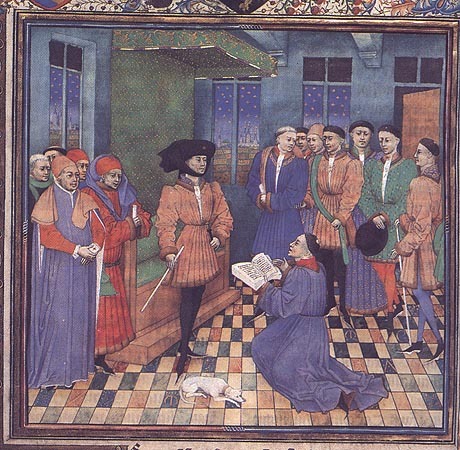 Commentary: Attached at first to Jean de Bourgogne, the governor of Picardy, Jean Wauquelin was an author, editor, and copyist of texts for Philippe le Bon. He died at Mons in 1452. At the suggestion of one of his counselors, Simon Nockart, a native of Hainaut, Philippe le Bon commanded Wauquelin to make a French translation of the Annales Hannoniae by Jacques de Guise, a Dominican chronicler of Valenciennes. The payment for the first volume was made in 1448 and the entire copy was completed in 1453. Several scribes associated with Wauquelin contributed to the project including Jacquemart Pilavaine and Jacotin du Bois. It was under Wauquelin that the first volume was illuminated. 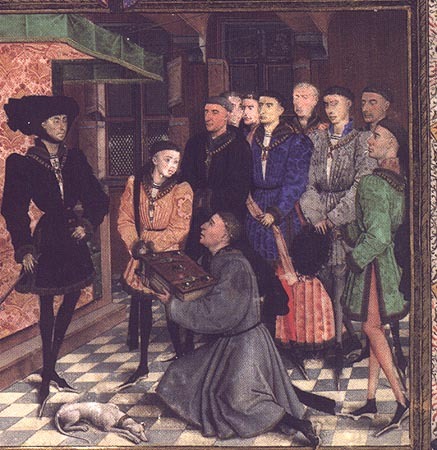 The last two volumes did not receive their decoration until 1468 during the reign of Charles the Bold. 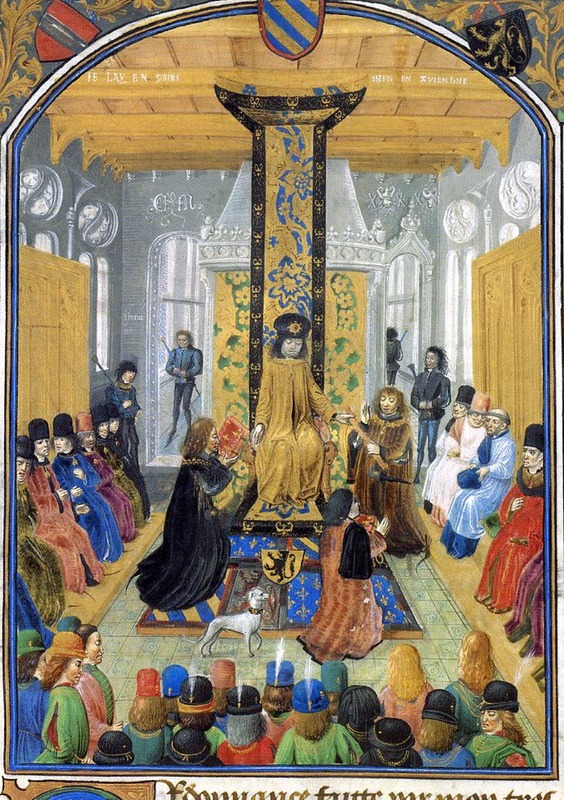 Ms. 9243 was illuminated in the style of Guillaume Vrelant while ms. 9244 is in the style of Loyset Liedet. 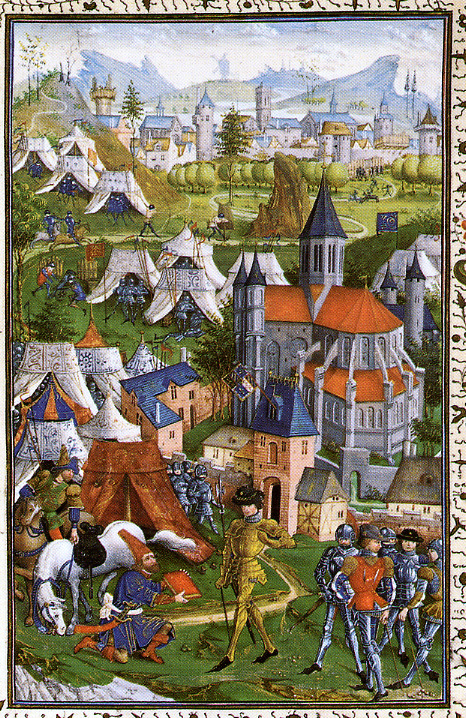 The miniature on fol. 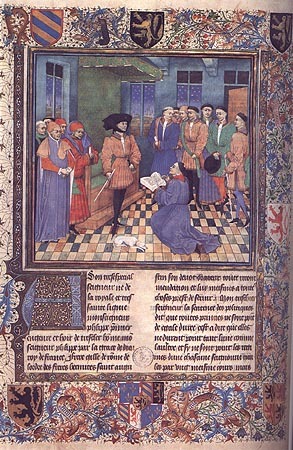 1 of ms. 9242 shows the kneeling Jean Wauquelin or perhaps Simon Nockart kneeling presenting the volume to Philippe le Bon. Philippe stands under a brocaded canopy. He holds in his hand a hammer, a symbol of his power. 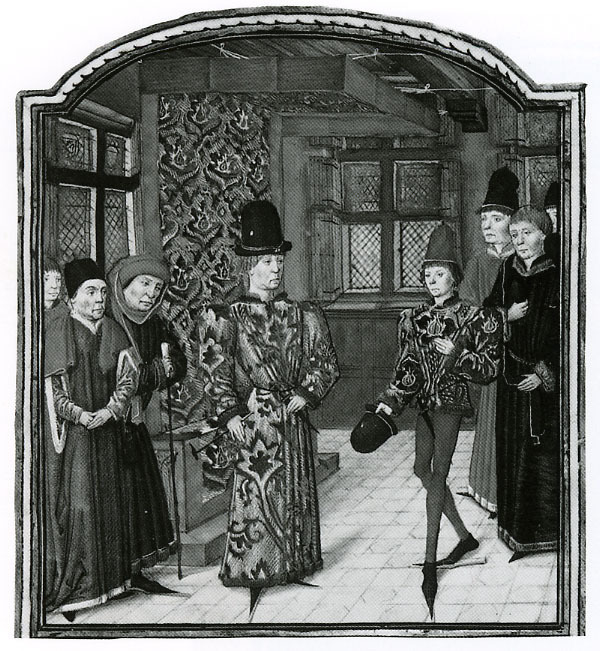 To his left, stands the fifteen year old Charles de Charolais, his only legitimate son. 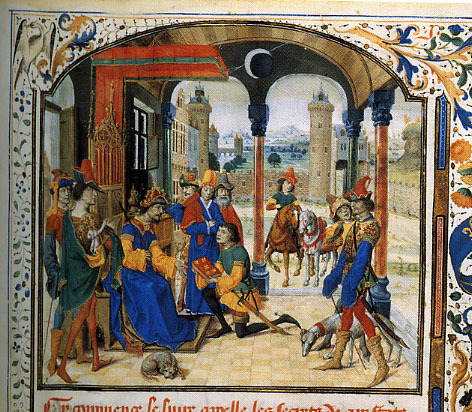 Among the dignitaries and knights of the Golden Fleece, several of Philippe's principal advisors can be identified. Chancellor Nicholas Rolin can be identified in blue robes to the left of Philippe. 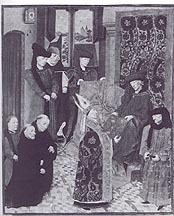 In a cassock stands Jean Chevrot, the bishop of Tournai.The figure standing behind Rolin and Chevrot is possibly Simon Nockart. 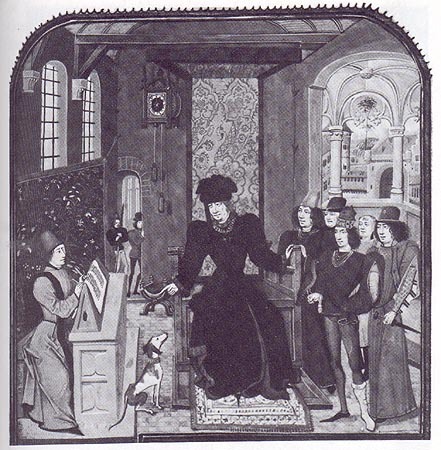 In a black doublet stands Antoine, le Grand Bâtard, and in green, Jean de Croy, the patron of Wauquelin. The Duke of Burgundy's arms appear at the top of the page, while the other arms are those of the different territories under the control of the Duke of Burgundy. Bibliography: Charles le Téméraire, pp. 80-81, no. 5. 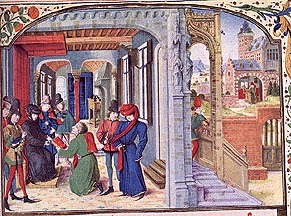 Commentary: the miniature of folio 1 shows Wauquelin (?) reading from the Chronicle. 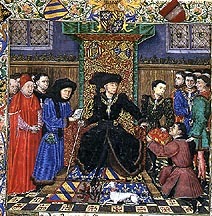 Philippe le Bon is shown seated on a throne, while, standing to his right, is Charles de Charolais. 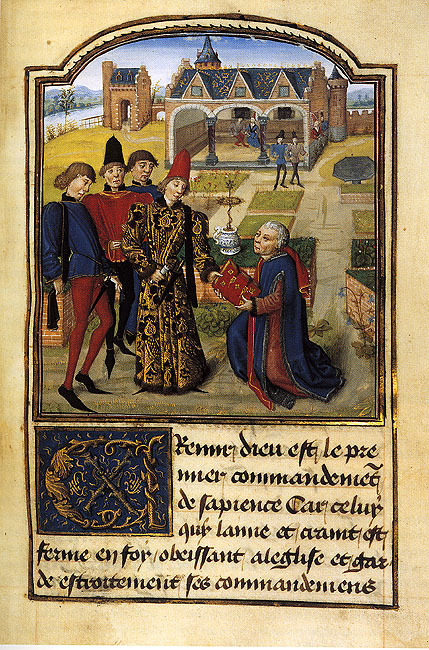 Vrelant apparently did not paint this miniature until 1468 during the reign of Charles the Bald, but this miniature shows Charles as the same age as he was in the first volume (ms. 9242). 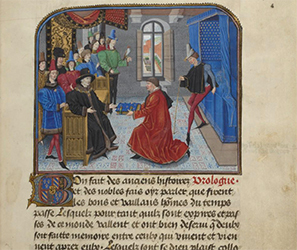 Commentary: The Roman d'Alexandre was produced by Jean Wauquelin along with the Roman de Girart de Roussillon and the Chroniques de Hainaut. 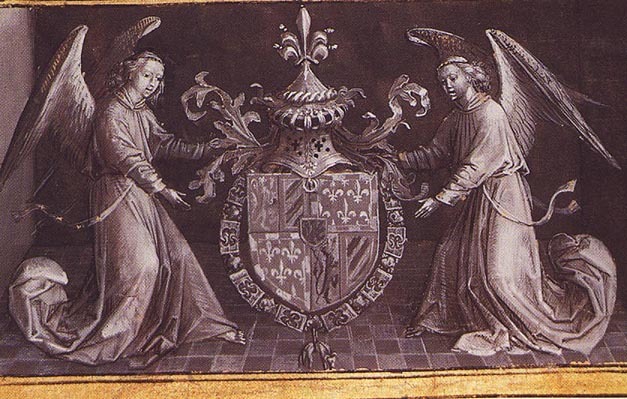 All three of these texts include the arms of Philip the Good. 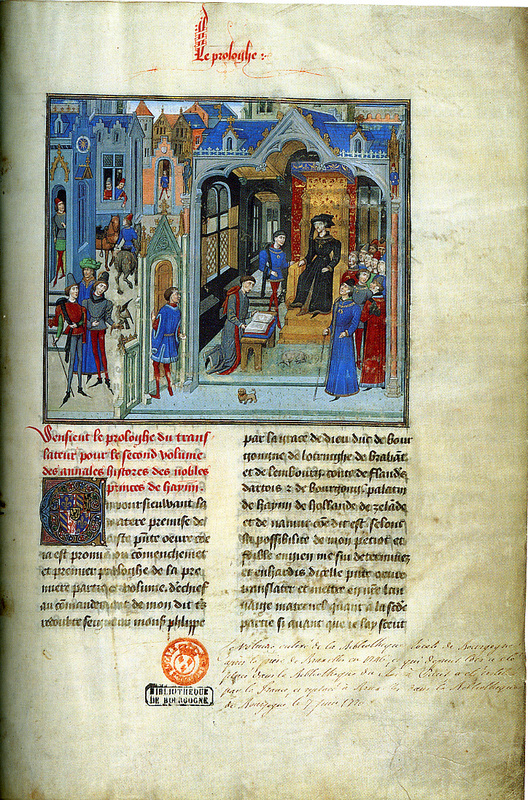 The preface of the Chroniques de Hainaut records that Wauquelin had produced his translation of the Roman d'Alexandre in 1446 when he was still attached to Jean de Bourgogne the governor of Picardy. Wauquelin produced the translation of the Roman de Girart de Roussillon in 1447 for Philip the Good. Bibliography: L.M.J. 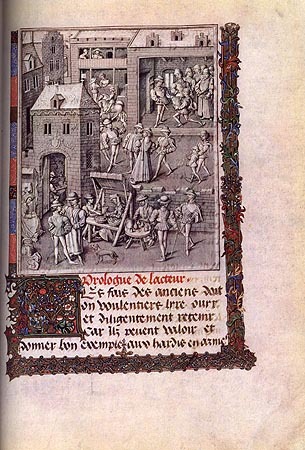 Delaissé, "Les 'Chroniques de Hainaut" et l'atelier de Jean Wauquelin a Mons, dans l'histoire de la miniature Flamande," Miscellanea Erwin Panofsky, Bulletin Musées Royaux des Beaux Arts, 1955, pp. 21-56. 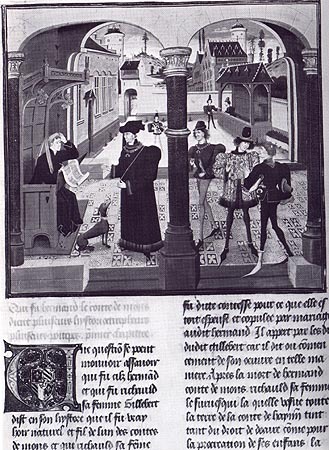 Jean Miélot presenting his translation of the Traité sur l'Oraison Dominicale to Philip the Good. Bibliography: La Miniature Flamande, p. 89 no. 90. 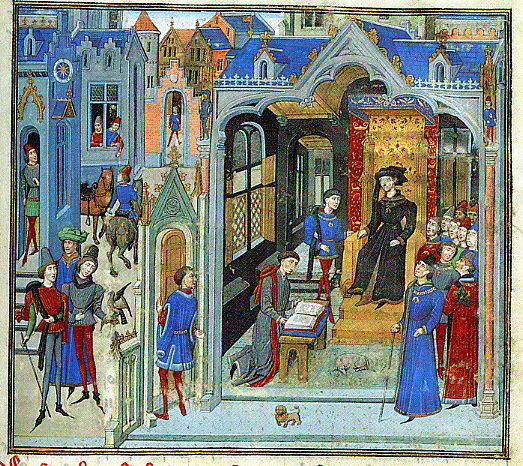 Commentary: the manuscript was made for Louis de Gruuthuse. His arms and devices were replaced by those of Louis XII. 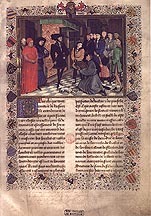 The text was written about 1460 and dedicated to Philip the Good. The story recounts the exploits of the young hero Jason and his companions, the Argonauts, on their expedition to Colchis on the Black Sea to recover the Golden Fleece. It also tells of his fatal attraction to Medea, the daughter of the King of Colchis. 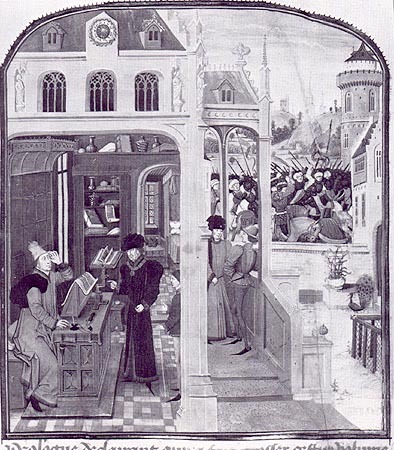 Bibliography: La Miniature Flamande, pp. 130-131, no. 158; Illuminating the Renaissance, p, 243, no. 59. 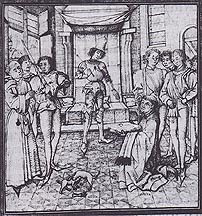 Title: Secrets des secrets, translation of Secretum secretorum; and Jacob van Gruytrode, Miroir de l'âme pécheresse,translation of by Jean Miélot of Speculum aureum animae peccatricis. 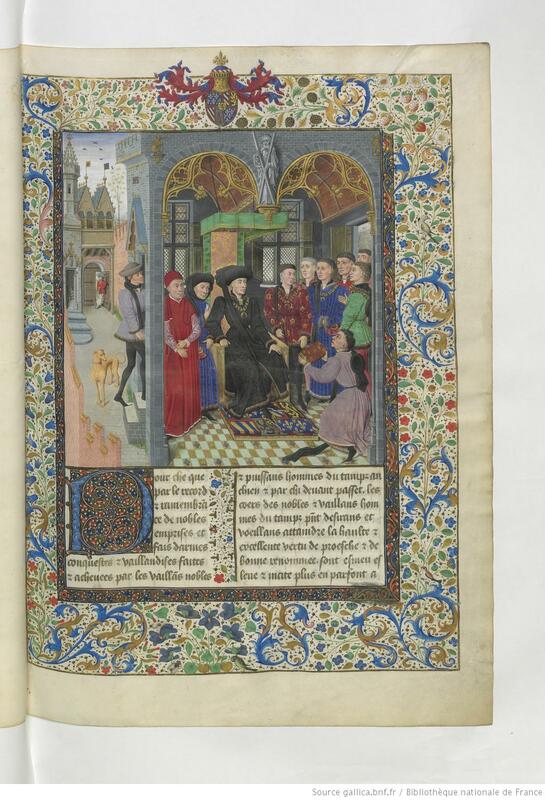 Commentary: This manuscript was made for Louis de Bruges. 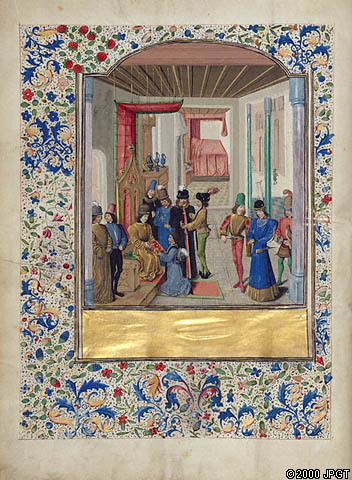 The miniature on folio 7 showing Aristotle presenting his manuscript to Alexander the Great can be attributed to the Ghent miniaturist Liévin van Lathem. 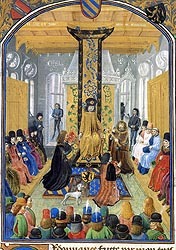 The miniature is clearly based on the conventions of presentation images in Burgundian manuscripts. This clearly makes the association between Alexander and the Duke of Burgundy. Bibliography: La Miniature Flamande, p. 131, no. 159; Illuminating the Renaissance, p. 245, no. 60. Getty Museum, MS. Ludwig XV 8. Artist: Attributed to the Master of the Jardin de vertueuse consolation. Bibliography: Getty website; Scot McKendrick, The History of Alexander the Great: Illuminated Manuscript of Vasco da Lucena's French Translation of the Ancient Text by Quintus Curtius Rufus, Los Angles, 1996. Commentary: ms. 9066 is the first volume of a text that comprises ms 9066-9068. 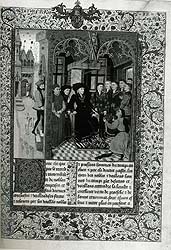 This is the first text completed by Aubert a native of Hesdin who would become the greatest editor from the time of Philippe le Bon. In the prologue of Part I (B.R. 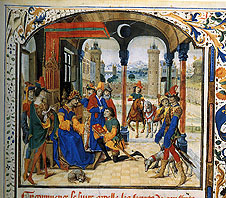 9066), Aubert states that he began this history of Charlemagne for Jean de Créqui, one of the courtiers of the Duke, but the colophon of part III (B.R. 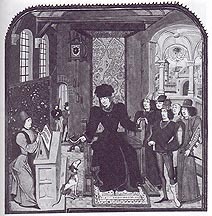 9068) states that the work was commissioned by Philip the Good. 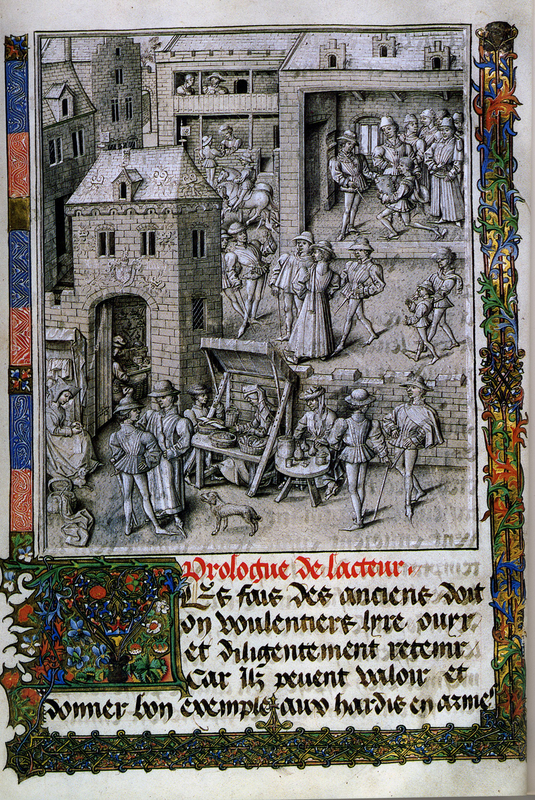 Bibliography: La Miniature Flamande, p. 130, no. 157. 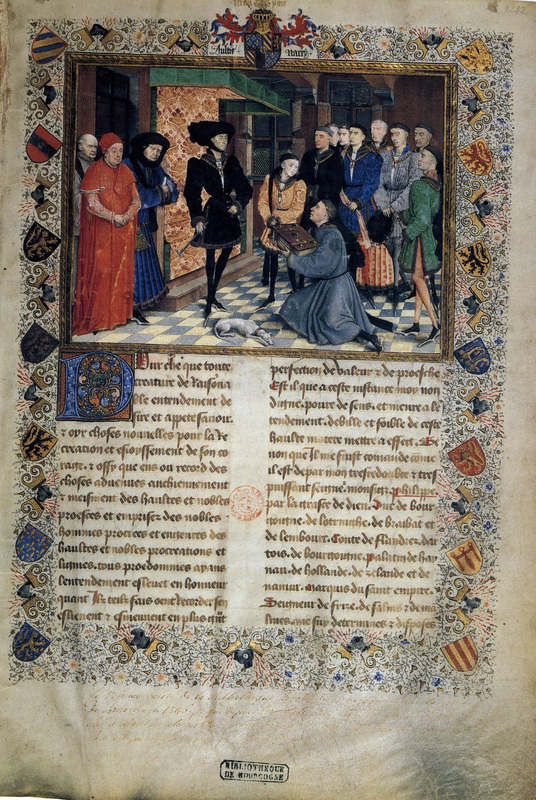 Charles the Bold being presented with a copy of the manuscript, fol. 7. Commentary: Text translated before 1474 since the Duke's titles "duc de Gueldre et comte de Zutphen" are not included. The similarity of terms used in the prologue to known texts by David Aubert has led to the attribution of this translation to Aubert. 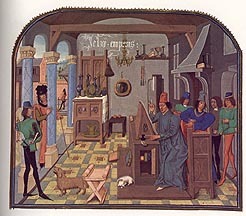 Charles the Bold's device "Je l'ay emprins" appears on the back wall of the miniature. Bibliography: Charles le Téméraire, no. 14, pp. 94-96: Dogaer, pp. 106-112. Artist: Master of the St. Bertin Altarpiece. Commentary: The Master of St. Bertin completed the illumination of this manuscript left unfinished by others. 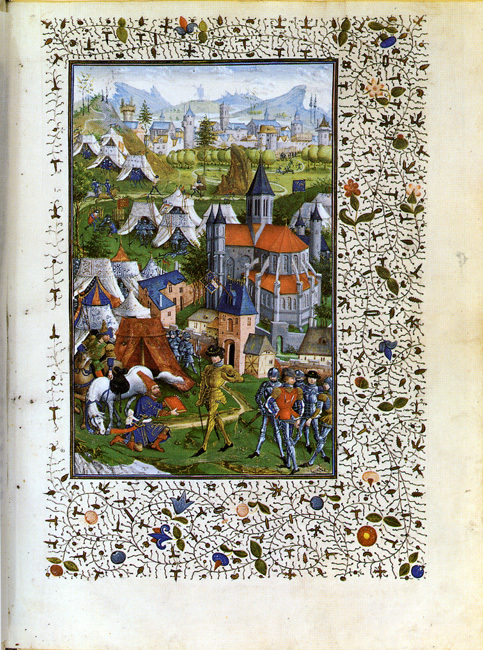 Paris, Bibliothèque de l'Arsenal, ms. 5072, folio 4r: Renaud de Montauban. 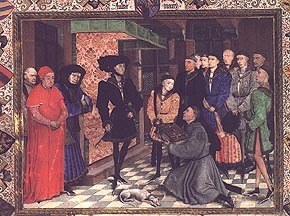 Presentation of the manuscript to Philip the Good. 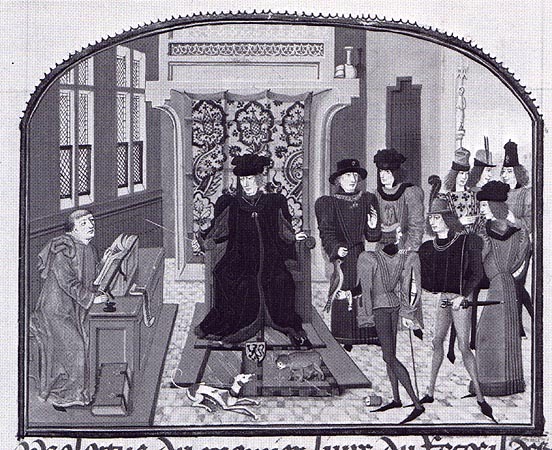 Commentary: Miélot was appointed as secretary by Philip the Good in 1449. He continued in this function under Charles the Bold. 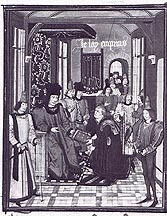 Ducal accounts record that one of his major functions was as a translator of texts from Latin into French, he translated some 30 treatises. 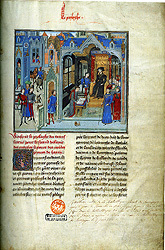 In 1449, Miélot translated the De Nobilitate of the Italian humanist Buonaccorso da Pistoia for Philip th Good. The Latin text had been written in 1429 and dedicated to Carlo Malatesta of Rimini. The work is a debate before the Roman Senate between an idle man of noble birth, and an active Roman citizen of obscure and humble origin, for the hand of a lady. Here noblity of birth is set beside nobility of "virtue" as defined by a civic humanist of beginning of the early Renaissance. Miélot's position in this debate seems to be tipped in the presentation miniature. Here the Duke is wearing the armor associated with the old nobility and the preponderance of the figures in the miniature are representatives of the old nobility. 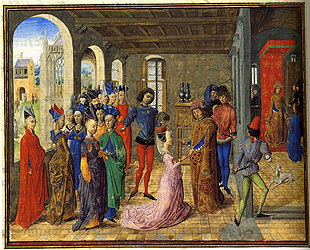 The one figure who appears to represent the new nobility appears on the left side of the miniature. This figure's gesture of appeal to the duke is apparently blocked by the man next to him holding a large sword. A fight has broken out over a bone between the usually tranquil dogs lying at the feet of the duke in traditional presentation images. Bibliography: Dogaer, 87-89; Vale, War and Chivalry,p, 21: C.C. 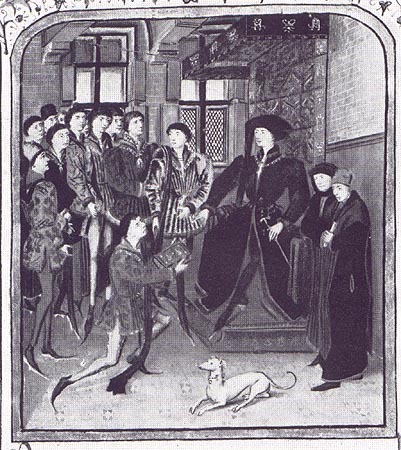 Willard, "The Concept of true nobility at the Burgundian Court," Studies in the Renaissance, 14 (1967), pp. 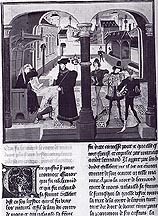 33-48; Baron, The Crisis of the Early Italian Renaissance, pp. 420-3. The Arms of Philip the Good with the collar of the Order of the Toison d'or. 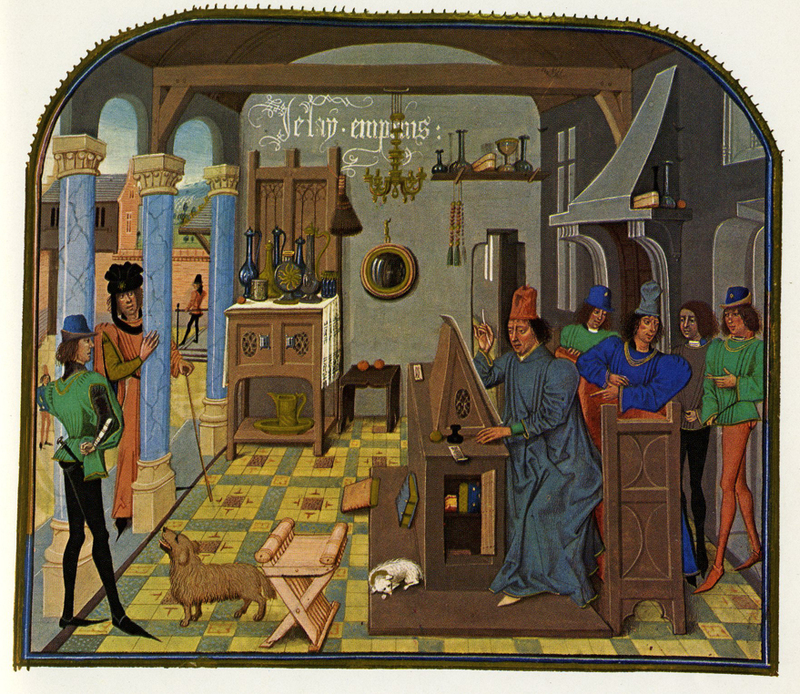 Commentary: presentation miniature is loosely based on the frontispiece of the Chroniques de Hainaut. Bibliography: Dogaer, pp. 15,63, 77, 82. Commentary: In 1468 the Portuguese humanist Vasco da Lucena completed his translation of a history of Alexander the Great by the ancient writer Quintus Curtius Rufus. 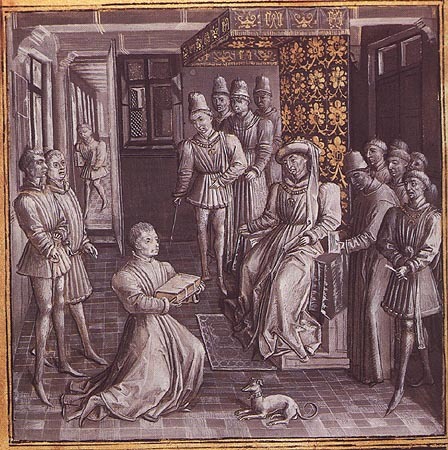 Charles's mother, Isabella of Portugal was the patron of Lucena. 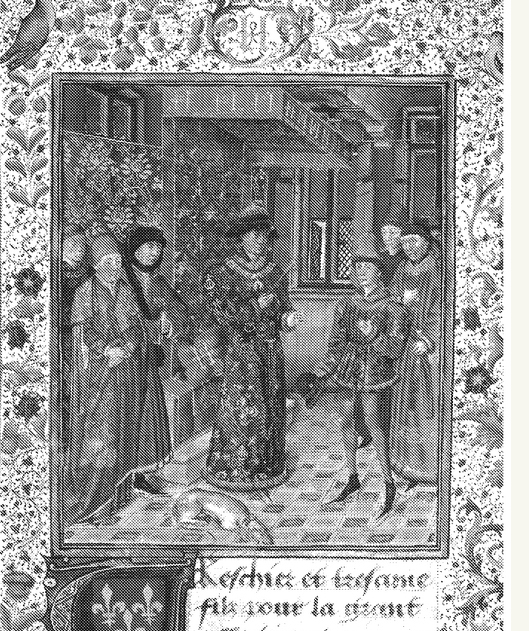 The text reflects the dynastic ambitions of Charles and his father. 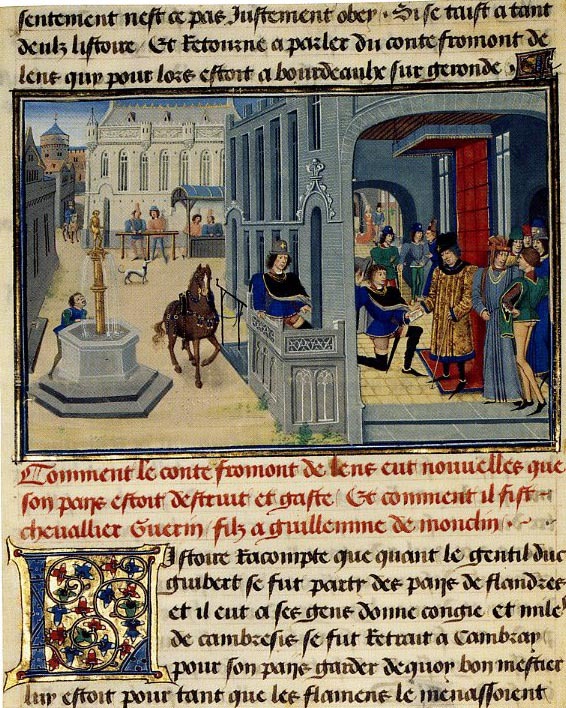 In November 1470 Loyset Liédet was paid for eighty-six miniatures ("74 grandes et 12 petites") and for the decorated letters, a damask binding, a white leather case, and delivery to Hesdin. 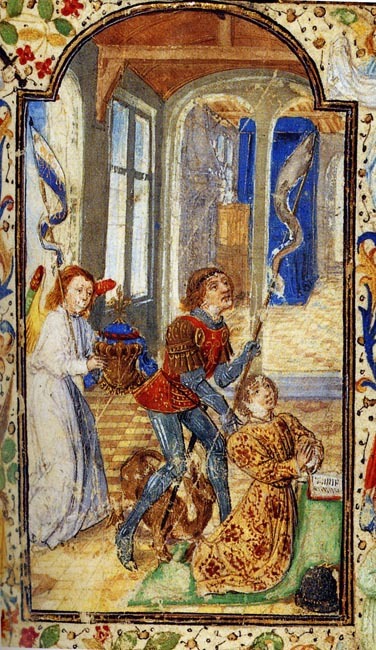 Antoine de Schryver identified this inventory entry with the Paris manuscript. 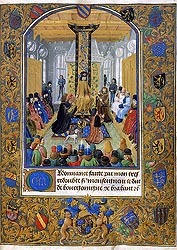 The arms of Charles the Bold appear in the initial beneath the presentation miniature. Garand, and Pierre Jodogne, vol. 2: 469-79, Ghent 1979; Illuminating the Renaissance, pp. 227-229, no. 54; Scot McKendrick, "Illustrated Manuscripts of Vasco da Lucena's Translation of Curtius's Historiae Alexandri Magni: Nature Corrupted by Fortune?" 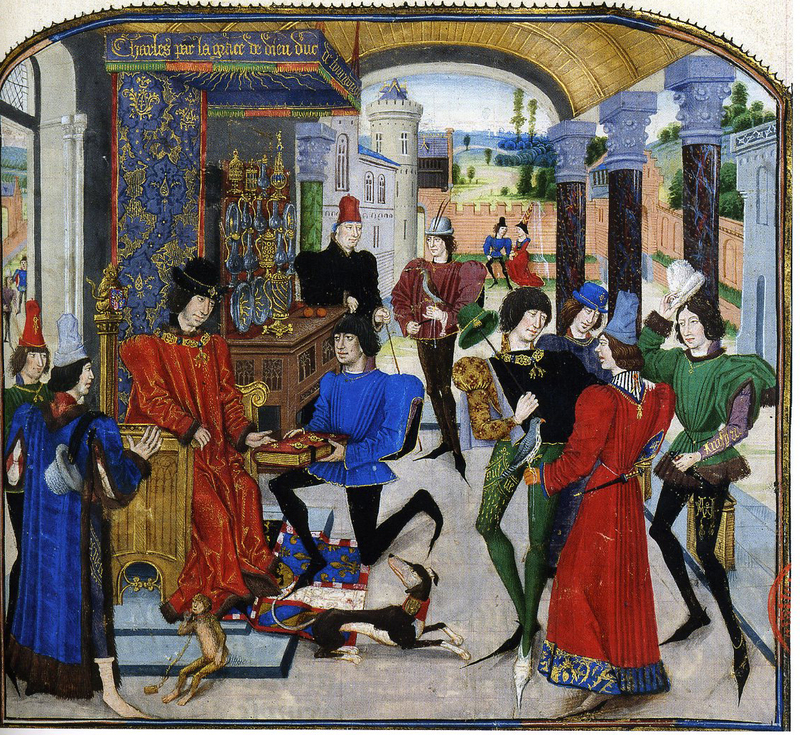 In Medieval Manuscripts of the Latin Classics: Production and Use. 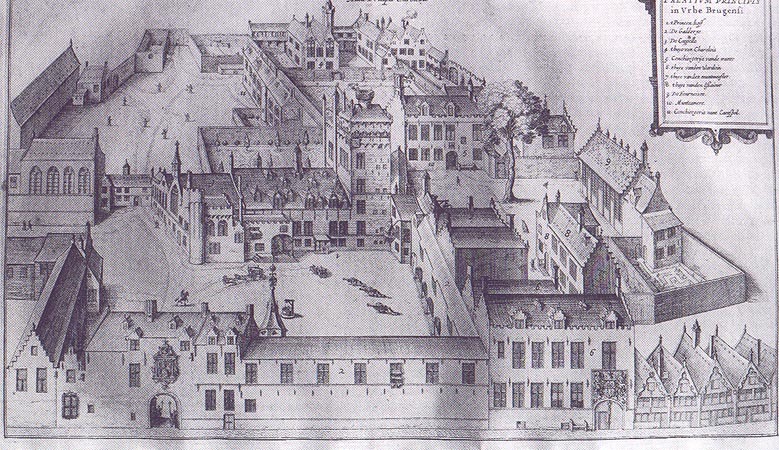 Proceedings of the Seminar in the History of the Book to 1500, Leiden, 1993: 131-49. Los Altos Hills, Ca. 1996. Title: Aegidius Romanus, De regimine principium translated by Wauquelin, Le Livre du gouvernement des princes. 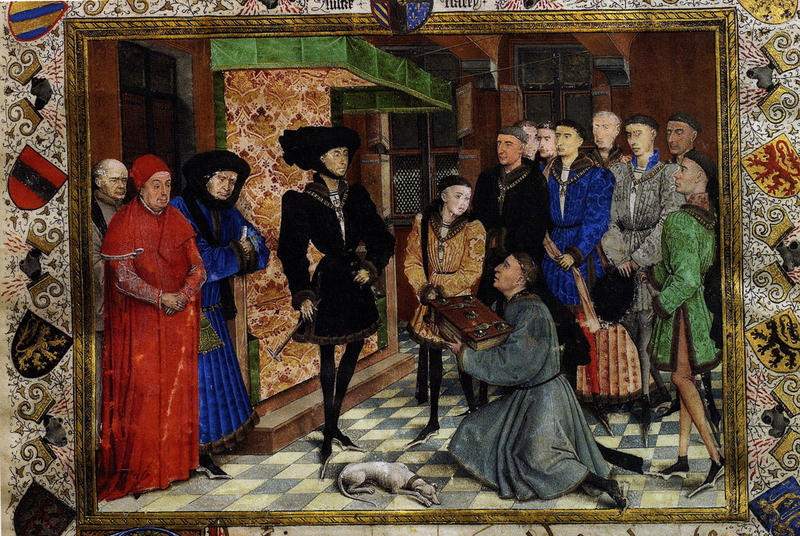 Scribe: Jacquemart Pilavaine of Mons was paid in 1452 for work on the manuscript by Philip the Good. Illuminating the Renaissance, no. 64, p. 252-53: In August 1475 Charles the Bold paid for twenty-one copies of his military ordinances of 1473. 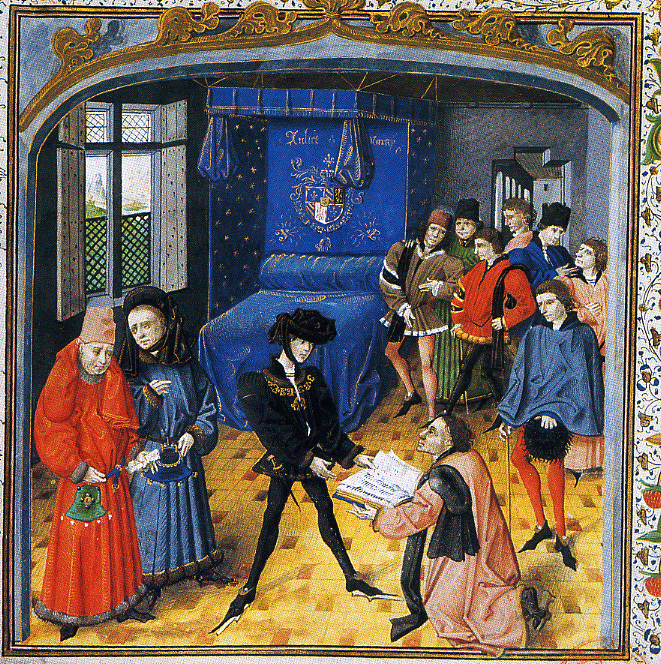 His valet de chambre and illuminator, Philippe de Mazerolles, was paid for both the script and the illumination. 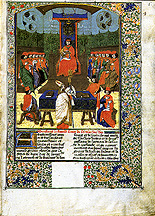 One volume, called "the original" was embellished with a large and expensive miniature and a fine box to house the appended seal of Charles. 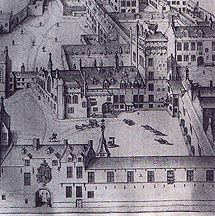 The present volume has been identified as that volume and thereby as Charles's own copy of the ordinances. 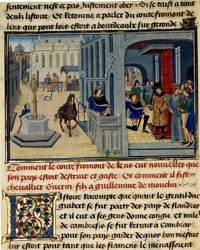 Moreover, its miniature has been considered by de Schryver to be a documented work of the illuminator Philippe de Mazerolles. 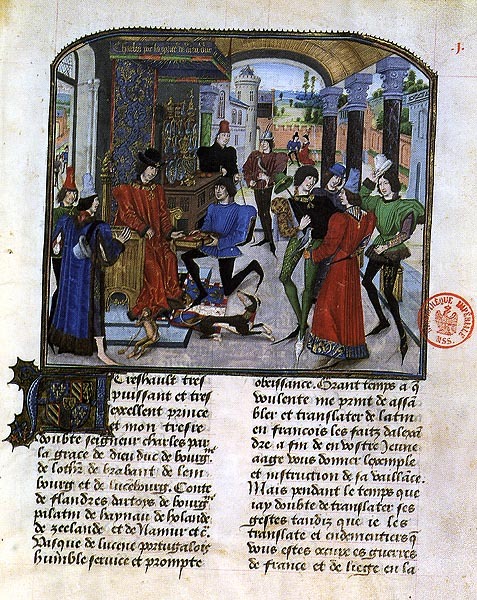 It is clear, however, that several different hands were responsible for both the writing and the illumination of the six surviving copies; thus Mazerolles was clearly paid for work undertaken by others. 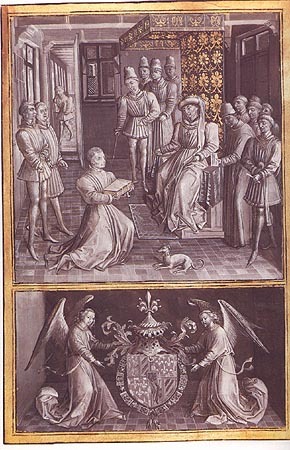 Bodo Brinkman has accordingly attributed the miniature in the present copy to the Master of Fitzwilliam 268. The opening miniature is a tour de force. 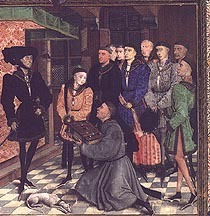 The overall composition is based on the same model of authority used by contemporary illuminators to portray Charles as head of the Order of the Golden Fleece. In its detail, however, it also offers an exemplification of the installation of Charles's military captains. 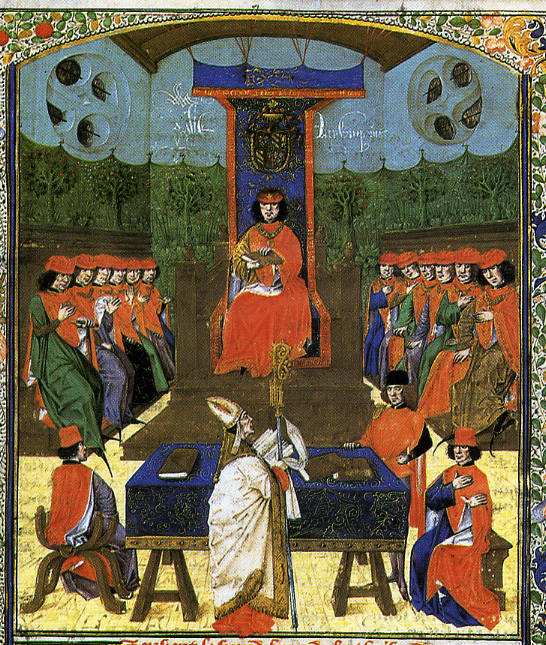 Seated on Charles's right are knights of the Order of the Golden Fleece; on his left are lay and clerical members of his council; in the foreground, facing Charles, stand twenty unarmed captains. In the middle an additional two captains receive copies of the ordinances, and another his baton. Clearly, this image is not a photographic record, but a formal template for the ceremony. Like the content of the text, it forms a ducal ordonnance. Given its importance, the duke's own illuminator must have been closely involved in the formalization of this image. 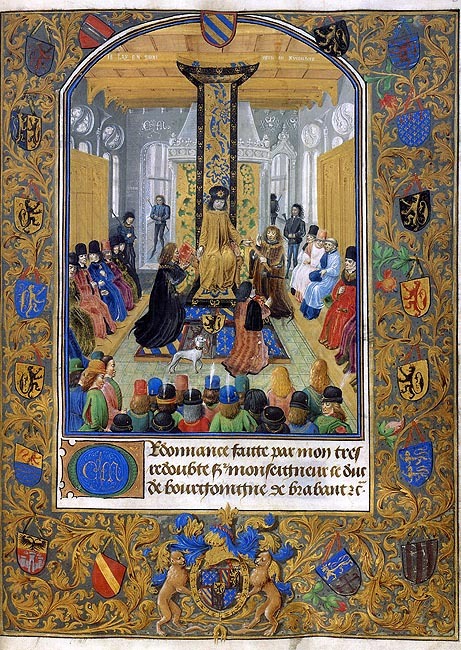 Commentary: The miniature shows Charles the Bold presiding over the Chapter of the Order of the Golden Fleece with the bishop Guillaume Fillastre appearing at the bottom. Born about 1400, Fillastre became in 1460 the bishop of Tournai and the chancellor of the Order of the Golden Fleece. 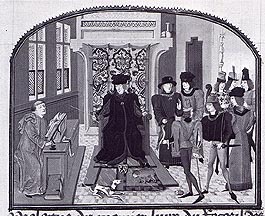 Fillastre wrote his history of the order between 1468 and 1473. 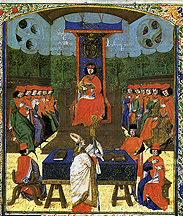 A number of copies of the text were made for the different members. 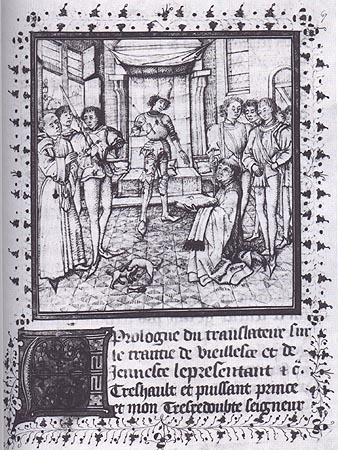 They regularly have the same formulaic frontispiece to Book II representing the 1473 Chapter during which Fillastre presented his Histoire to Charles the Bold who had requested the text at the 1468 meeting. 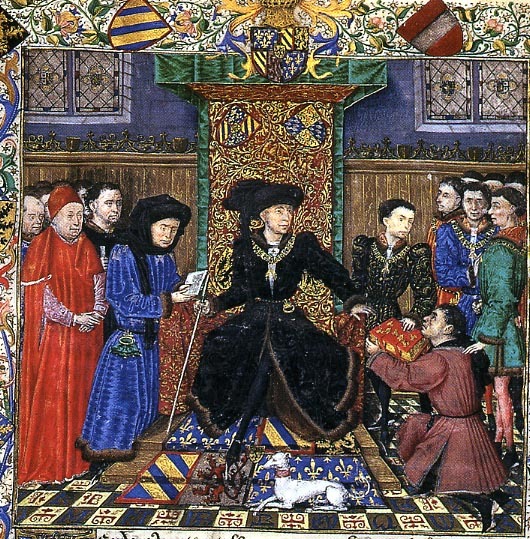 The miniature shows Charles seated under a blue cloth of honor embroidered with his arms. 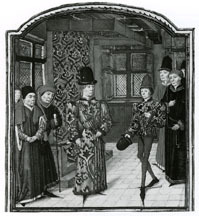 Members of the order wearing the Order's collar and scarlet robes flank the Duke. 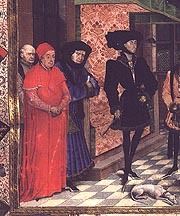 Fillastre in the robes of the bishop of Tournai stands in the foreground. 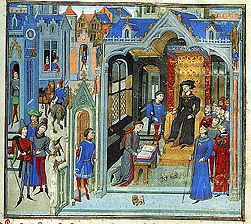 folio 5: King Ollerich instructs Foliant de Ionnal to write book of instructions for the king's son Rudolph. 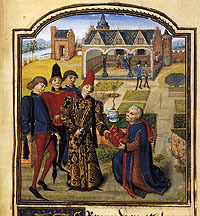 Foliant de Ionnal presents his text to Rudolph of Norway. 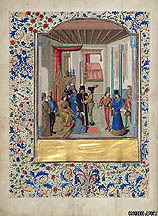 folio 66: A Prince before his father. Introduces Enseignements paternels. 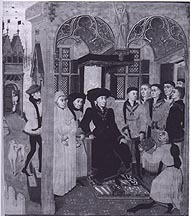 Guillebert de Lannoy, L'Instruction d'un jeune prince and Enseignements paternels. 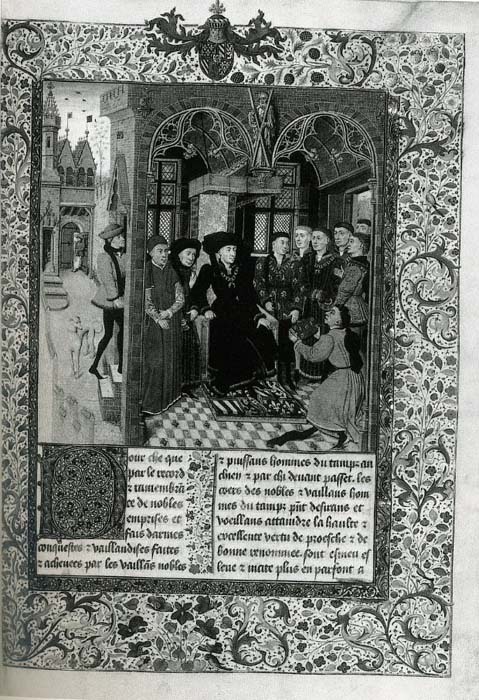 Commentary: Jean Hennecart was paid by Charles the Bold for illuminating two small books, each containing L'Instruction de josne prince. The Aresenal manuscript conforms exactly to the Burgundian account record. 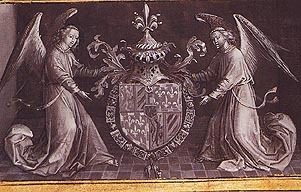 The appearance of the arms of Margaret of York along with the duke's, indicates a date after 1468, the year of their marriage. 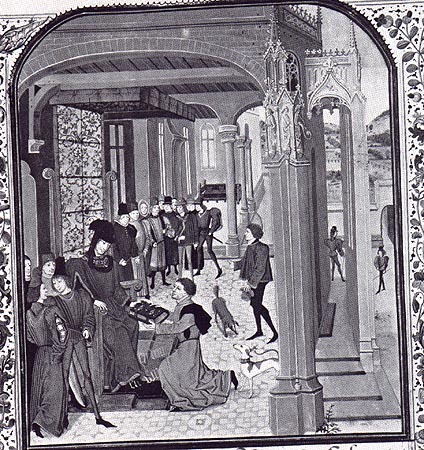 Guillebert de Lannoy was from one of the most prominent noble families and he was a counsellor of Philip the Good and a member of the Order of the Golden Fleece. The book belongs to the genre of text known as advice books. In it he lays out the code of conduct of a good prince. 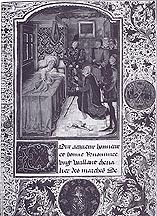 The text is set in the context of ancient Norway when the dying king asks his trusted counselor Foliant de Ionnal to write a book of instructions for his son Rudolph. 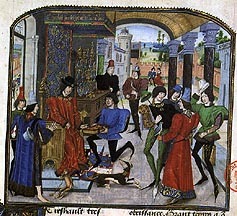 The parallels between the King of Norway and his son and Philip the Good and Charles the Bold were certainly not lost. This is made even more explicit by the miniatures added to the Arsenal manuscript. 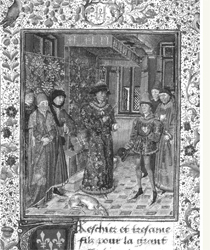 Elements of each of the three miniatures are based on the Chroniques de Hainaut frontispiece. 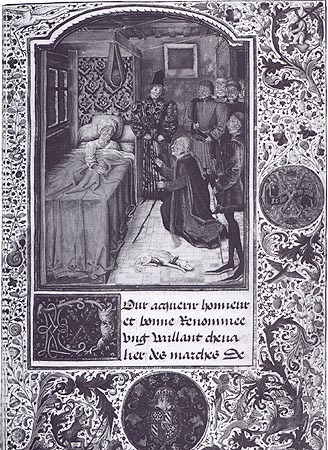 In the death bed scene on folio 5, the group of courtiers on the right are closely based on the courtiers on the right hand side of the Chroniques frontispiece. 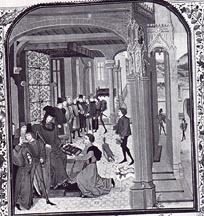 The sleeping dog in the foreground of the Arsenal miniature is also derived from the Chroniques miniature. 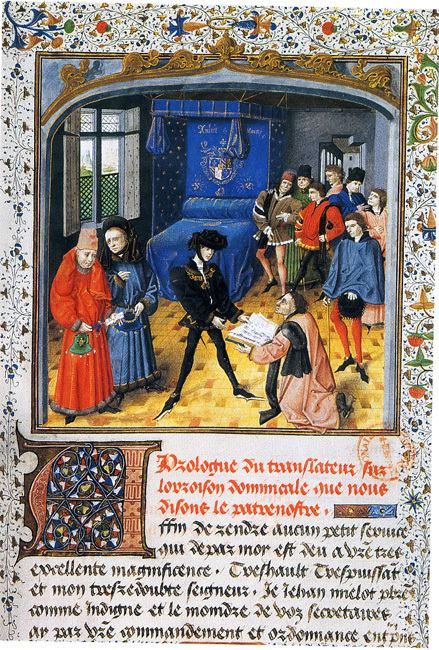 The Wauquelin / Nockart figure offering the volume to Philip the Good in the Chroniques frontispiece is the source for the figure of Foliant de Ionnal in the miniature on folio 14 of the Arsenal book. 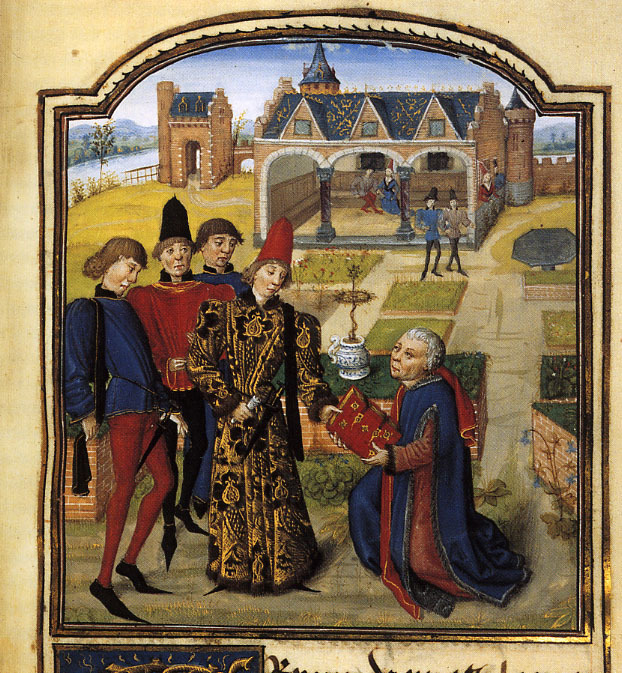 In the miniature introducing the Enseignements paternels, the group on the left including the father are clearly based on the left hand side of the Chroniques composition. Bibliography: Illuminating the Renaissance, pp. 234-237, no. 56. 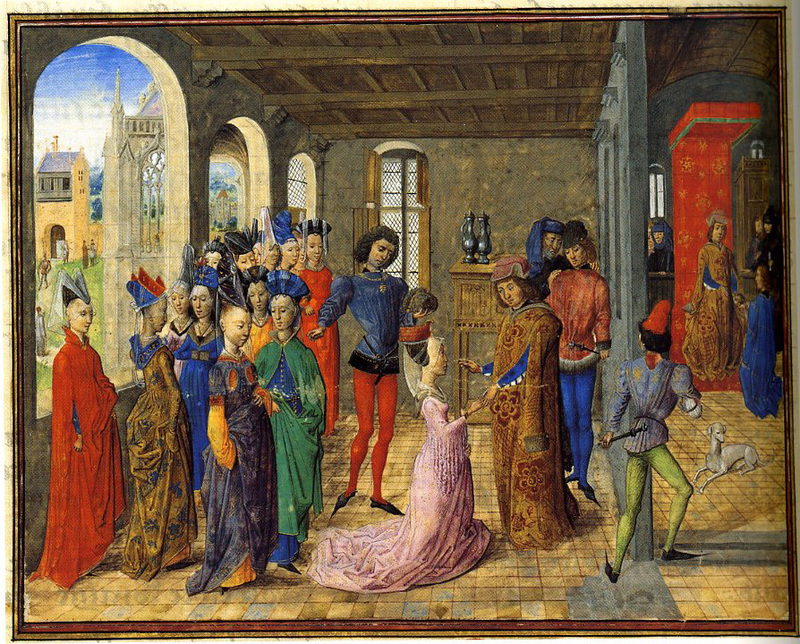 Compare to the spaces of the frontispiece of Paris, Bibliothèque nationale, fr. 331 also by Lieven von Lathem (illustrated above).